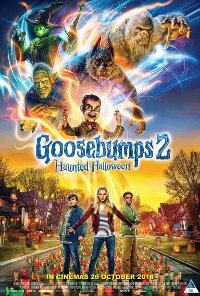 The sequel brings Slappy back to cause more havoc with three teens at Halloween, as they explore R.L. Stine’s strange universe after discovering a hidden book. Note that Jack Black has had his role relegated to a minor character. Adventure, Comedy, Family, Fantasy, Horror. Comments Contains scenes of horror. 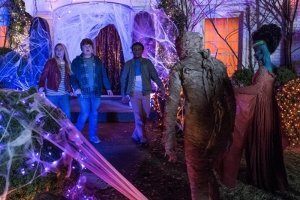 The film contains complex and mature themes exploring a dummy that comes to life and terrorise a family, a halloween tradition coming to life, science experiments, a haunted house, a super natural dummy seeking a family, facing rejection, seeking revenge using super natural powers, friends and family working together to overcome evil . Although they are presented within a comedic context, they are dark and sinister.Comedy does not mitigate themes such as occult practice and demonic evolution which may be emulated by younger impressionable viewers under the age of 10 years. Furthermore, they may be unable to cognitively process the context of the dark presentation of the storyline and think that it is okay to seek revenge using evil tactics which may cause moral harm. Moreover, the scenes of a dummy seeking revenge and terrorising people in the city, kidnapping a mother, tightening her on the chair whilst she was pleading to be freed and electrifying her to turn into a dummy doll will be scary and psychologically unsettling, confusing, distressing and/or disturbing to children under the age of 10 years. Parental guidance is advised for children 10 to 12 to offer support.